Indian States have witnessed a rapid growth in their population in the last 10 years. Get more details, facts and information on Population of states in India. Statewise Population of India - With a population of over 1.35 billion, India has witnessed a huge growth in its population in the last 50 years. According to estimates, India will become the most populated country in the world by 2030 leaving behind China. Population of Indian states like Uttar Pradesh, Maharashtra and Bihar is more than many countries around the world. Uttar Pradesh, India’s most populated state is currently home to over 223 million people. Most of the states in India are very densely populated as compared to other places in the world, thus leading to danger of environment imbalances. Population growth rate of many highly populated states in India is 5% to 18% in a decade. This growth over the years brings an alarming sign for the whole nation as natural resources are limited in future. Government of India has taken several steps to check population growth in the states but with very little success. Uttar Pradesh tops the chart in most densely Populated stateq	in India. According to recent estimates, there are more than 227 million people living in the state of Uttar Pradesh. With a growth rate of 9.42%, Maharashtra is second most populous state of India. Bihar with a population of more than 121 million is the third most populous state of India. With a population of over 100 million, West Bengal is the fourth most populous state of India. The state of Andhra Pradesh stands at fifth position, in terms of population in India. Madhya Pradesh is currently home to more than 83 million people in India. 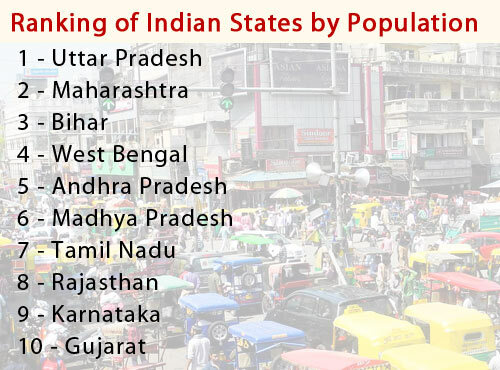 The state is 6th most populous state of India. Tamil Nadu is 7th most populous state in India with a total count of 79 million people in 2018. Rajasthan is 8th largest state of India in terms of population. Its Population is estimated to be over 7.7 crores (2018). According to Census of India, Karnataka is nine largest state of India. Gujarat with a population of 68.9 million is the 10th most populous state of India. The state has witnessed a population growth of 19% in this decade 2001 to 2011.